This fall, the Eli Review team happily welcomes 80+ new instructors and 18 new institutions. We’d like to introduce ourselves by answering some common questions. Who is the Eli Review team? With the help of two executive mentors, a marketing firm, and development team, we support about 60 institutions enrolling 25,000+ students per year in assigning feedback and revision cycles. Why does Eli Review exist? In 2008, Jeff Grabill and Bill Hart-Davidson were asked to teach an online 5-week Business Communication course. They couldn’t coordinate draft and feedback exchange quickly enough using existing tools, so students didn’t get the practice they needed to improve. That failure led them to realize that they couldn’t teach their values without a technology to support a feedback-rich environment compressed in time and space. 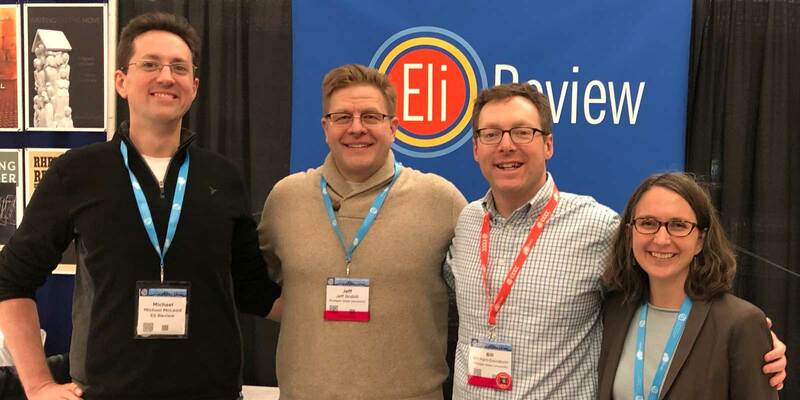 With Mike McLeod and others in Michigan State University’s Writing in Digital Environments program, they built Eli Review. They spun it out of the university into a business because there was no other funding model to be sure someone could answer the phone when instructors had a problem (learn more from Jeff’s 2016 Computers & Writing keynote). Today we offer writers and writing teachers a unique environment where coaching better feedback and better revision is faster and more effective. Enough of you agree with us that we’ve been able to fund our operations and product development via sales since 2012. That’s a huge feat, especially considering how often and how substantially we revise the app in response to user feedback. What’s next for Eli Review? In the coming year, we will continue our work on engagement analytics and data visualization so that instructors can gauge the frequency, intensity, and quality of writing practice in their courses. And as always, we’ll work to make the experience of using Eli truly outstanding and enriching. BTW, why is it called Eli Review? The first funding for developing the app came from the Eli Broad School of Business, so when the team was asked to name the app, we looked up, read the sign over the door, and went with it. We used to joke that Eli was the most helpful kid in class. We don’t do that anymore since only we laughed. It’s still true, though. Not So Random Facts about the Eli Review Team was published to the Eli Review Blog in the category CCCC. Previous Post: Tip: How can students get notifications when Eli tasks are due?